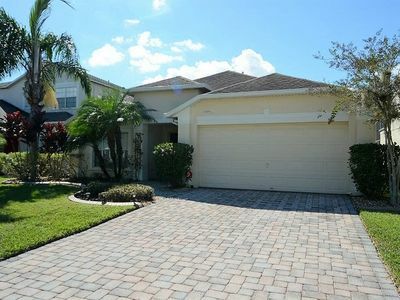 Gated community, private screened pool, 4 BR, 3 BA, living room, dining room, kitchen, washer/dryer. 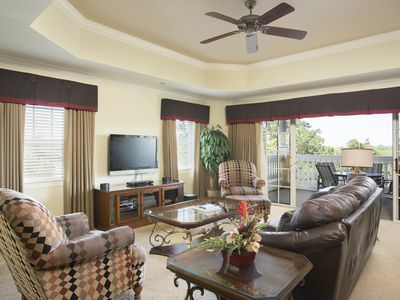 This spacious, comfortable room is beautifully furnished and looks directly out onto the swimming pool and patio area. 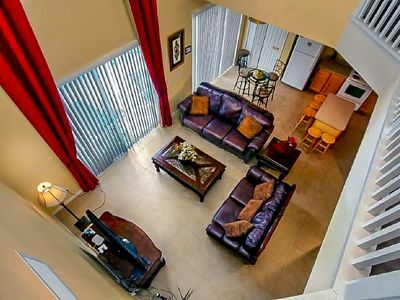 It has sofa, coffee table, lamps, cable TV, DVD player, PS2 console and wireless internet. All furniture is of the highest quality. The patio doors lead directly outside to the pool area. The ample dining area has a large table with 6 dining chairs. This area is centrally located with easy access to the kitchen. The kitchen is fully equipped with a large refrigerator & freezer with ice-maker, oven, microwave, dishwasher and waste disposal unit. All dishes, pots, pans and cutlery are provided for your convenience. There is also a breakfast table and four chairs as well as seating at the bar with two stools. There is a fully equipped laundry area at your disposal with washing machine and tumble dryer, iron and ironing board. 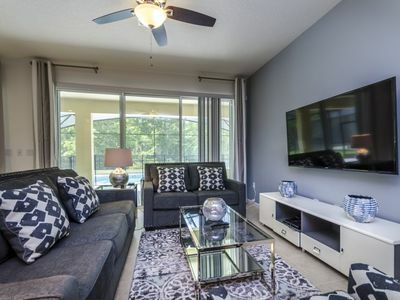 The first master bedroom has patio doors leading to the pool area and contains a king size bed, dresser, night stands, telephone, DVD player and a TV with cable. There is a large en-suite bathroom with full bath adjacent. The second master bedroom also has patio doors leading to the pool area and contains a queen size bed, dresser, night stands, VCR player and cable TV. There is a large en-suite bathroom with shower adjacent. Bedrooms 3 and 4 both have twin beds. There are also dressers, ample wardrobe & storage space. Both rooms are served by a third full bathroom. All towels and bed linen are provided for all bed & bath rooms. 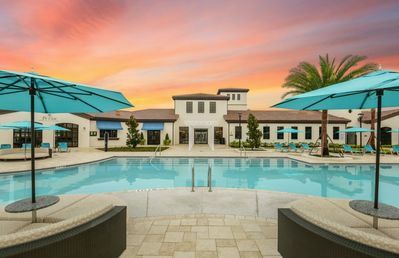 The most welcoming site after a hard day at the parks is your very own screened pool area! The pool area has space for sun bathing and relaxing. Table and four chairs are provided along with two sun loungers. 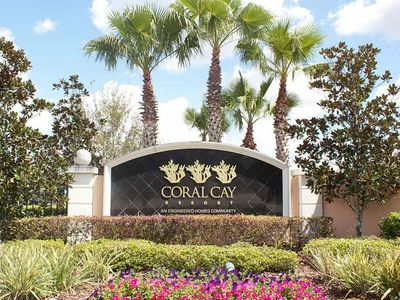 Gated community located near many central Florida attractions, restaurants and shopping. 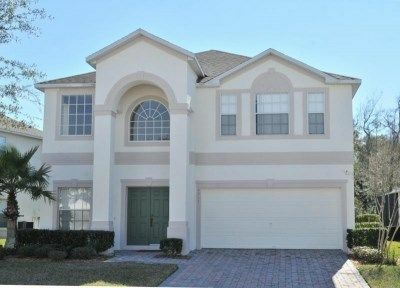 25 minutes from Orlando International airport, Disney, Universal Studios, Seaworld, and many more activities. 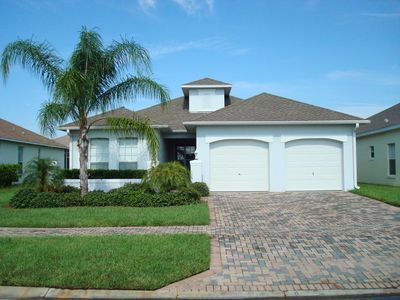 8 BR Villa, Pool/Spa, Water View, 3 mi from Disney Parks! 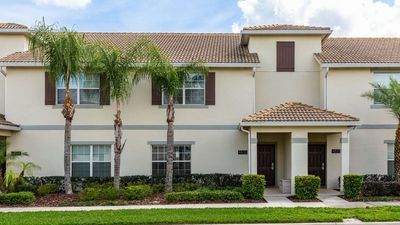 Luxurious 5 bed townhome with splash pool! 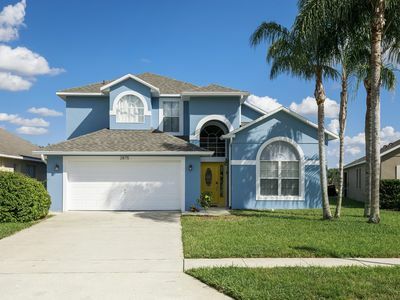 4/3 Orlando Vacation Home with GORGEOUS WATER VIEW & OUTDOOR SPA! 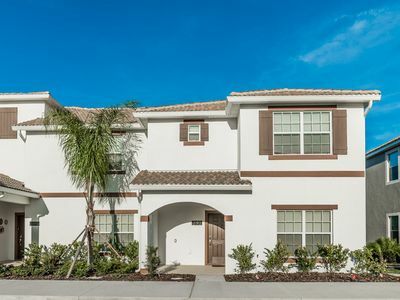 Your story book vacation awaits at this amazing townhome!